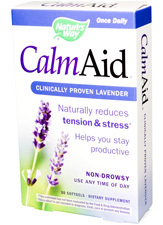 CalmAid® by Nature's Way, helps reduce tension and stress and helps you stay productive. CalmAid® contains Silexan™, the orally administered lavender oil used in clinical studies. Ingredients: (per serving) Silexan Lavender (Lavandula angustifolia) Essential Oil - 80 mg.
Other Ingredients: Canola oil (non-GMO), gelatin (softgel), glycerin, sorbitol, annato extract color. Suggested Use: Take 1 softgel daily with a glass of water, or as directed by a healthcare professional. Caution: Not intended for use with children. Do not use if pregnant or nursing. If taking prescription medications, consult a healthcare professional before use.